For anyone who doesn’t know, Bollywood Ka Boss is a new Indian television show on the Sahara Filmy channel, hosted by Boman Irani. It’s a Hindi film trivia quiz show, and I was very honored to have them do a special short segment on me: a pagli American girl who essentially has nothing better to do all day but obsess about Hindi movies and retain all kinds of useless information about them. It was lots of fun! I can’t believe that Boman Irani ever did anything but act (although he did)—he seems to have been born to entertain. He is effervescently tireless, an amazing singer, genuinely funny, and one of the nicest and most down-to-earth human beings I’ve ever met. He also knows more film trivia than anyone I’ve ever met, way more than I ever will (although he seems to have many better things to do than obsess about Hindi movies). They ask some tough questions on this show! I would encourage anyone who loves Bollywood and has access to Sahara Filmy to watch it and learn. I really enjoyed myself and hope they got some footage they can use, anyway. Everyone was very warm and welcoming and put me at ease (although I was much more comfortable behind the scenes than in front of the camera). Coincidentally, one of the contestants there on the same day (Shilpa) also reads this blog—it was great to meet her. Small world! And finally, if they ever see this, I’d really like to thank Meena, Sonam and Mohan in particular for taking such great care of me, and Raju for making it happen. Posted on January 24, 2008 at 4:05 pm in Hindi movies	| RSS feed You can skip to the end and leave a reply. So incredibly exciting! How did you get involved in it to begin with? Boman Irani is a wonderful performer; I loved him in Bluffmaster and Main Hoon Na. Omigosh! Lucky you! I hope you enjoyed being in India – I guess it’s becoming like your second home, isn’t it? Is it possible if you could upload at least the segment of the show which you featured in? You look great in the photo and the guy who was doing your makeup looks quite hot. I always enjoy being in India, it does feel like a second home any more! I should be getting a DVD of the episode I’m in once it’s edited etc…not sure when it will air, probably a couple of months from now. I will at least try to put screen shots up here :-) Sadly, I was too nervous to notice that the makeup guy was hot! After Munna Bhai MBBS came out, I got to know the director Rajkumar Hirani through a mutual friend…he has since become a good friend of mine, and he set it up. I had a wonderful time talking about Hindi films with Boman and company. I think the researcher on the show has the best job in the world :-) and really hope BKB does well. It’s chock-full of interesting information for Hindi film fans. That sounds amazing – you look lovely in that photo. Stumbled upon this blog and now became a lifetime fan of yours. I am an avid movie watcher but of late dont get much time to watch movies or access them….I have saved a lot of them for my retirement..
Great going and such a warm feeling that you do not understand the language and follow it through sub titles…. Hi..i also participated in this show..
but couldn’t make to the next round..i came 4th in my shoot. Did u also participated as contestant ..?? Did you Jaspal? How funny! 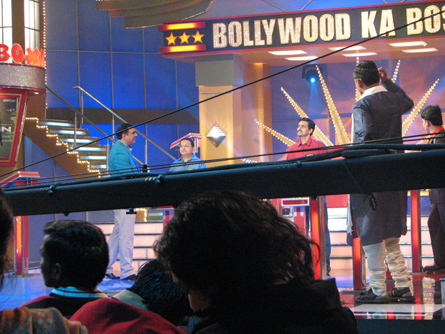 I didn’t participate as a contestant (I don’t speak Hindi), just as a special guest (really “special” if you know what I mean) at the beginning. I’ve linked to my appearance which is on Youtube here and here. I taped it in mid-January—how about you? I loved the show, it was difficult, with great questions. Wish it had done better. I learned a lot from it and it was lots of fun! yup..i also enjoyed the show very much..
and my shoot was First of the Second Scheule i.e. mid jan. and it was telecast on 4th May. So u would haven’t watch any movie w/o subtitle ?? And in ur details u haven’t mention how did u get this Bollywood disease……and then so much tempted by it. As u can see tht hollywood’ movies standard is quite up and it is not of ur language so reason 4 this addiction……if u could explain !!!! i have made i lsit of movies to watch…i’ll send it to u and let see wht u have to say on tht…. We probably shot at around the same time :-) Mine was aired towards the end of May…if you read this post “Why Hindi movies?” you’ll see how and why I got addicted to them :-) I can understand Hindi better than I can speak it, but I need subtitles or I miss 90 percent of what’s happening. Thanks for the list—I have seen some of them, but not all by any means. I don’t think I’ll ever run out of Hindi films! 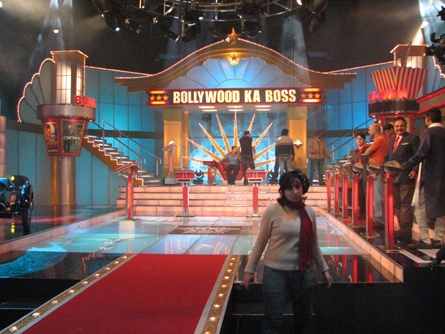 Hi, i was a contestant in the show and our episode was the first to be shot on 24th November 2007.I became the very first Boss after topping the first round.Unfortunately i met with an accident on the sets during the shoot itself and got hurt.My right hand fractured and chin got slashed.The next day ,on my insistence;the episode was continued.I lost the round afterwards. This episode was aired on 1st June 2008. It was fun to be there in-spite of my accident..I got one and half months plaster on my hand and stiches on my chin for a week. When i remember ,i feel happy that i was there,it was my bad luck that i met the accident. Nice to see your blog page.keep it up.